All of the rumors of football coach Mike Leach leaving Washington State fell aside Monday as the Cougars extended his contract through 2022. 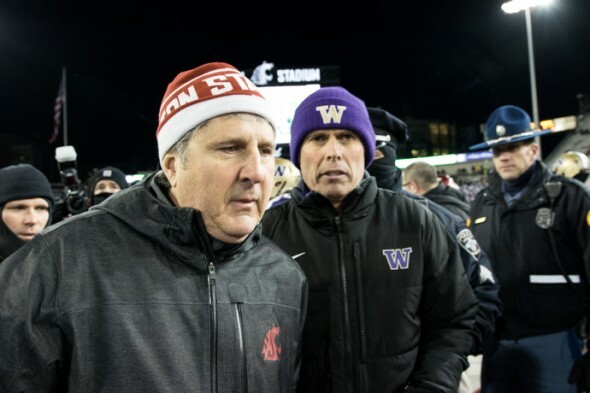 Washington State University and head football coach Mike Leach Monday agreed in principle to extend Leach’s contract through the 2022 season, updating his current deal to a new five-year contract. The agreement will pad Leach’s salary to potentially $4 million per year and also provide raises for his assistant coaches. “Coach Leach has led a spectacular turnaround in the fortunes of our football program during the last six years, and we want to keep him in the Cougar family for a long time to come,” said WSU president Kirk Schulz. Schulz also noted how the success of the football program under Leach has benefited the university at large. The Cougars are 9-3 and headed to their third consecutive bowl appearance, a first for a Cougar coach. He is also the first coach at WSU to post three consecutive winning seasons since Jim Sutherland from 1957-59. Leach had been linked to a couple of job vacancies since the end of the regular season — Nebraska, which hired ex-WSU athletic director Bill Moos in November, as well as Tennessee. Under the revised agreement, Leach’s 2018 compensation will be $3.5 million, $3.75 million in 2019 and $4 million in 2020. Following year three, Leach will receive a one-time retention bonus of $750,000. Additionally, the WSU assistant coaches’ pool will see an increase of $400,000. The Cougars began the 2017 campaign with six consecutive victories. WSU closed out its home schedule with a come-from-behind victory over No. 18 Stanford, then lost the Apple Cup to Washington 41-14 in Seattle. In his six seasons, Leach has 38 wins, second-most among any WSU coach during that same span. He has guided the Cougars to four bowl games in the past five years, also a first for a Cougar coach, and over the past three seasons, WSU has the third-most conference wins of any program in the Pac-12. Since Leach’s arrival, WSU’s attendance has gone from 76.1 percent of capacity in 2011 (year before he arrived), to 97.1 in 2017, the second-highest percentage at Martin Stadium in the past 20 years. The Cougars meet No. 18 Michigan State in the San Diego Holiday BowlDec. 28 (6 p.m. PT, FS1).